Heat oven to 425°F. Place pie crust in 9-inch glass pie plate as directed on box for One-Crust Filled Pie. Bake 8 to 10 minutes or just until edge begins to brown. If crust puffs up in center, gently push down with back of wooden spoon. Reduce oven temperature to 350°F. Cook frozen vegetables as directed on bag for minimum time. Pour into medium bowl. Cut up large pieces of potatoes. In 10-inch skillet, crumble sausage; add mushrooms. Cook over medium-high heat, stirring occasionally, until sausage is no longer pink; drain. Add sausage-mushroom mixture to vegetables in bowl; stir to combine. 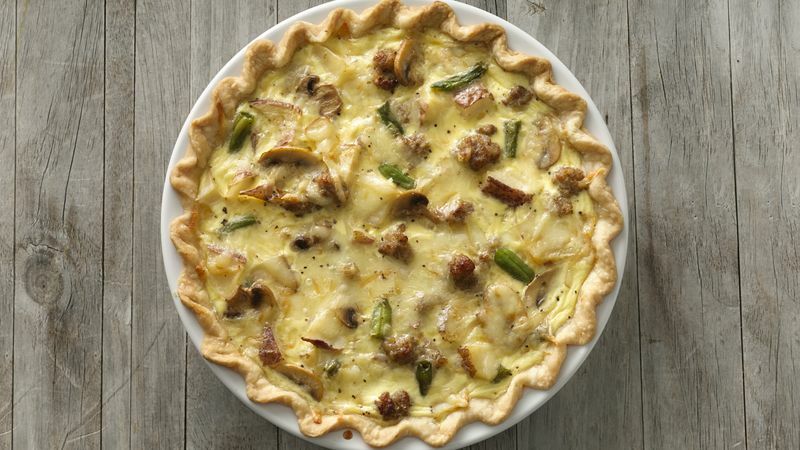 Spoon mixture into crust-lined pie plate; sprinkle with cheese. In medium bowl, beat eggs, half-and-half and pepper with whisk until well blended; pour over mixture in crust. Bake 40 to 45 minutes or until eggs are set in center. If necessary, cover edge of crust with strips of foil during last 20 minutes of baking to prevent excessive browning. Sprinkle with parsley. Serve this hearty breakfast quiche with a platter of fresh fruit and a pot of fresh-brewed coffee for a fast and fabulous holiday breakfast. Substitute a different cheese, if you prefer, such as Cheddar, Monterey Jack or provolone.